This essay is designed to highlight the sequence of new 14ers completed and understand the obstacles that impeded progress and motivations that ultimately allowed me to complete the list. I worked off the 58 14ers list that included El Diente, North Maroon, North Eolus, Cameron, and Conundrum peaks over 14k but failing to be 300′ above the saddle from another 14er. 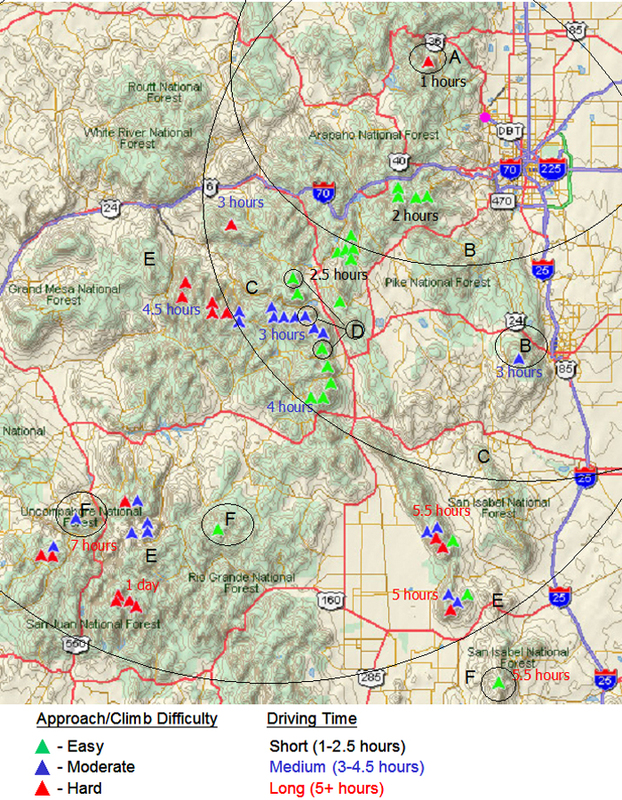 Anyone claiming to avoid El Diente & North Maroon for this reason is probably not being honest and is missing out on two of Colorado’s four “Great Traverses”. This list indicates the initial date of a personal summit; I have since since climbed Evans, Bierstadt, Democrat, Sherman, Longs, Grays, Torreys, Quandary, Belford, and Maroon multiple times and for at least one standard altitude gain effort. My resolve to climb the Colorado 14ers started modestly as a vague notion that someday I might do them all. Progress on the list came from a slight preference for doing new peaks vs. redoing ones I knew and liked. Such a slight preference often lost out to time constraints and other factors pushing for objectives close to home, and so my list of completed 14ers initially grew slowly and only while I had unclimbed peaks close to home. Later, as “the list” became more important, other issues arose to slow progress. These issues were eventually overcome by the persistent nagging of my friend, the 14er List. Below is the sequence and analysis of each major step, including information on route, partners & overall difficulty of the effort on that particular day or trip. (A) The Beginning: my first 14er is a very common first 14er, but mine was done in a very unusual way. At the time, I was a rock climber; bagging peaks was an incidental thing that barely registered as important. (B) The Tourist Peaks & Close to Home Snow Climbs: after I moved to Colorado, when I hiked alone or with beginners, I did easy summer walk-ups along with the masses; and, I started doing spring snow climbs with Brian. (C) The Snow Climbs: after a few successful snow climbs in 1997, Brian and I went on a 14ers bagging spree via snow climbs and ski/glissade descents during the weeks in between the downhill skiing and rock climbing seasons. (D) Bits and Pieces: having run out of nearby 14ers, and both Brian and I having acquired significant others, we started redoing 14ers and picking off lower peaks that were closer to home. With a bit of remaining momentum, I managed to finish off a few of the remaining easy, intermediate distance peaks with my wife in summer hikes. And then, the momentum died. (E) The Hard Ones: I had thought about picking up the 14er reins again during 2001, but couldn’t get past the fear of the harder peaks. I just didn’t feel confident enough to set out on my own, I suppose, and Brian had, by that time, given up over-night adventures for reasons that he alone can justify. My wife managed to work out with Brian a joint secret birthday present for me on my 40th birthday to climb the Crestone peaks with Brian. That marvelously challenging experience gave me the confidence and motivation to push on to bag all of the hard 14er peaks. (F) The Anti-climatic Finish: having completed nearly all the 14ers, I lost my enthusiasm for the list. I couldn’t get permission to climb Culebra via CMC; since I didn’t think I’d be able to finish the list, I just didn’t have any enthusiasm for finishing off the easy, isolated, distant peaks that remained. After a few years, I started thinking that I should just finish the ones I could do and let Culebra sort itself out; and I set aside a weekend to get Sneffels & San Luis. Later, when I looked into Culebra again, I found it was open to anyone willing to pay a stiff fee; so I just sucked in my outrage and signed up. And I found it to be a fine mountain in a far more pristine condition than the “free” peaks. And then it was over. It was an odd finish to my twelve-year 14er project. I felt more regret that it was over than I did pride for achieving a long-held goal. I didn’t celebrate or even tell anyone that I had finished, aside from the few who knew my plans. “The List” was a hard task master, but it served to provide enough added incentive that I was able to get it done. I certainly would not have done so without “the list” nagging at me over the years. I was sorry “the list” was gone. That sounds weird; don’t tell anyone.